view original piece on the Sitka blog. You blink. The days of beating the heat with a splash into your local lake are gone again. Seasons pass. Now skin is sheltered from the elements, and new forms of adventure take shape. 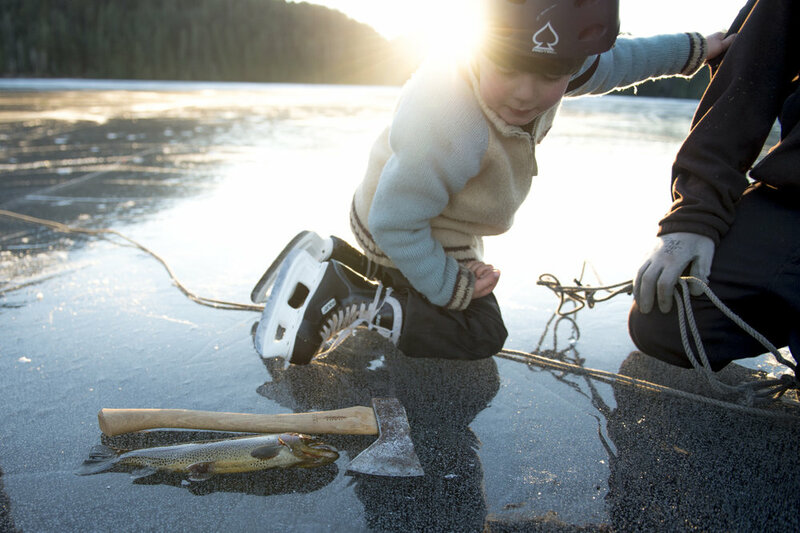 Fishing is an all-seasons adventure that looks different each time you drop your line. 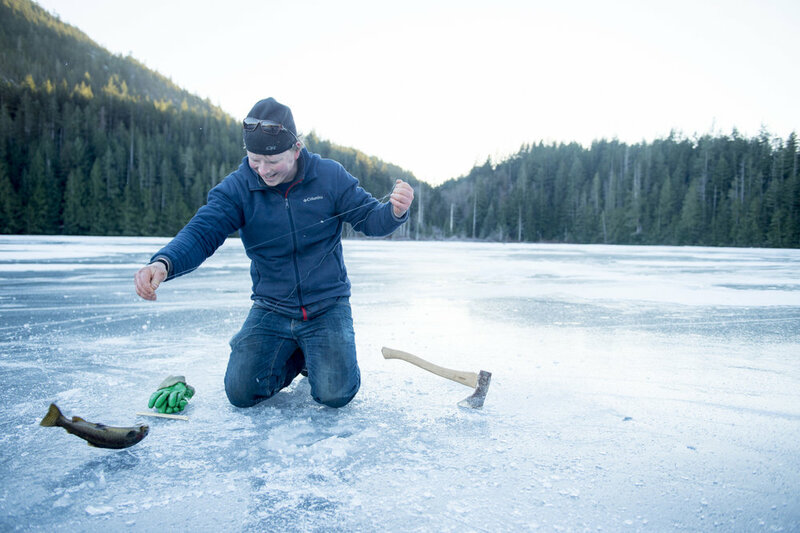 But the trout taste just as good, if not better, when caught by frozen fingers. Fresh food in the winter is a hot commodity. Whether it's a whopping spring salmon you can barely extend your arms far enough apart to illustrate, or a decent-sized little cutthroat trout to warm your belly in the winter, it doesn't much matter. Catching a fish never fails to ignite a round of legendary smiles. 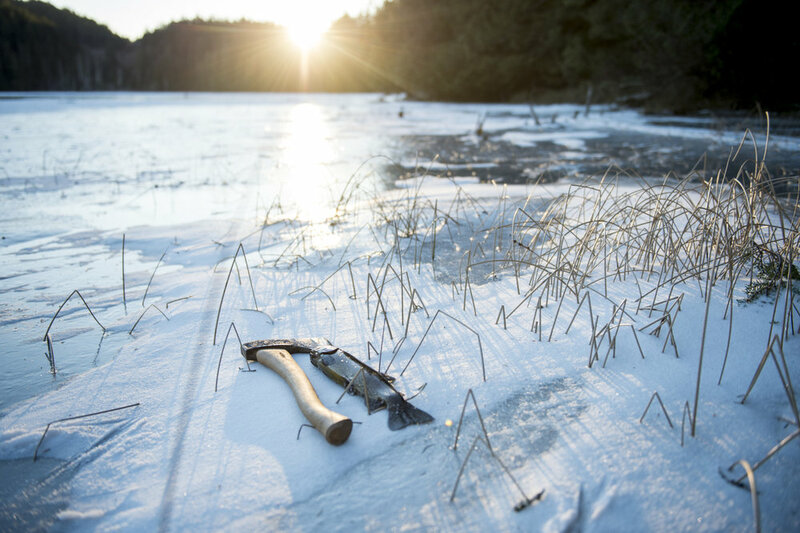 An axe might not seem like a necessary tool for fishing, but these days it sees more ice than firewood. The kids don't have a sense of it yet. Not consciously at least. The salmon are caught down the channel and the trout are jigged from the lake they are learning to both swim in and skate on. These fish are building their bones; they are becoming a part of them. 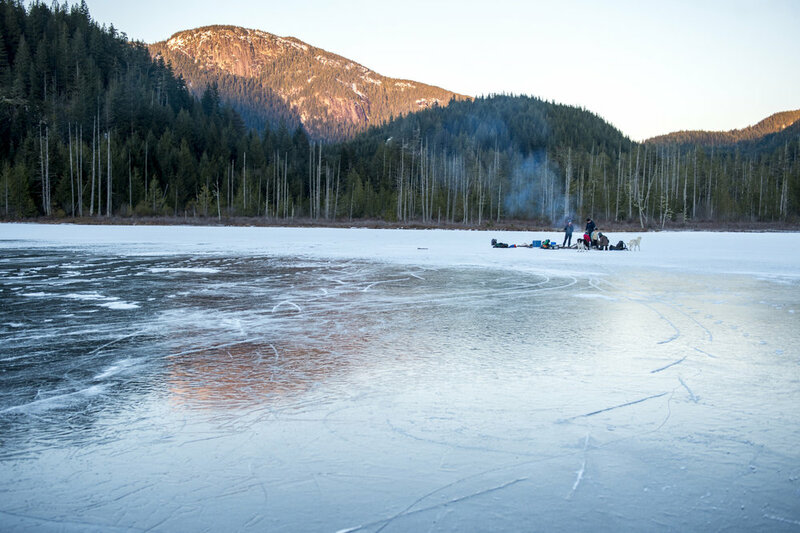 Providing supper and a connection to the land is something lakes, rivers, and oceans do best; frozen or otherwise. These adventures are nurturing worldviews that expand exponentially with each day spent outdoors. One evergreen truth that remains year round: any excuse to get a crackling fire going in the evening is a good one. A fresh catch just might be the best excuse to gather dry wood and good friends. The thing about getting out in your backyard here on the coast is that it's got everything you need to survive, and then some. Three of the most delicious cutthroat trout warmed several bellies around the fire that evening. Four-legged companions are always hungry for adventures that include fire-crisped fish skins. It is one thing to be aware of the luck we share by knowing this wilderness as our backyard. But it is another to become compelled to ensure the good fortune of a wild backyard is kept safe. Not simply for the sake of future adventures. Kept safe for the survival of our furred, finned, feathered, and human neighbours alike. The ones who know an irreplaceable relationship with the land, yourself included. The more seasons you get to know in the wild places you go, the more rooted you become in the landscape. Getting to know these mountains, lakes, rivers, and oceans in your backyard is what gives you the sense of belonging to the land. Belonging to the land, and not the other way around, is that thing - that thing that you're looking for but can't quite find in the supermarket or on sidewalks. It is that primary relationship with the places that give you air, water, and life. It is a relationship largely lost within the bounds of an insatiable culture of excess. It is a relationship that needs rebuilding. So you rebuild. Cupping a freshly roasted cutthroat trout in your palms, you peel hot meat from her bones and savour the taste. 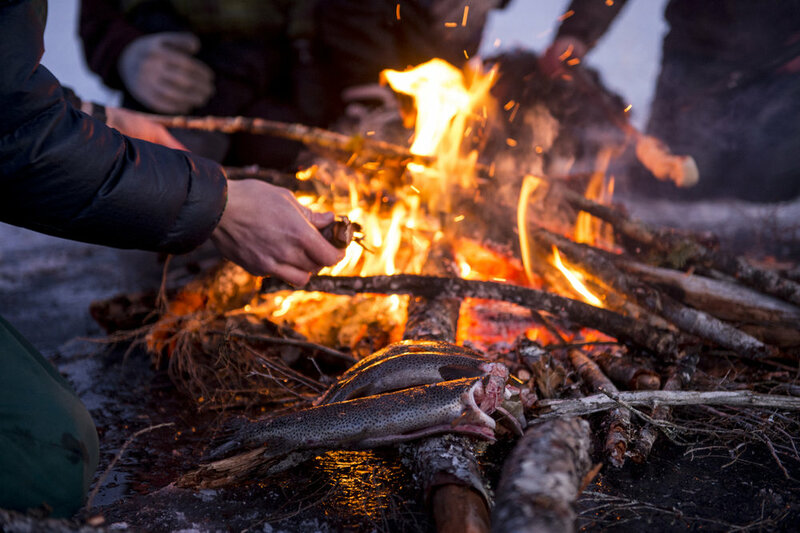 As you pass the fish around the fire to share, you find it is hard not to connect to this place that holds you. You find you belong to the lake, and to the fish, for the night. One by one, backyard adventures turn into a lifetime of vivid memories in places tangibly rooted in your bones. Something special happens when you belong to the land. The fresh air, water, wildlife, and moments absorbed inextricably link you to these places. Your relationship with the land grows whether your adventure lasts for an afternoon, a night or two in a tent, or the rest of your life. And the beautiful thing about relationships is that they go both ways. Those places you belong to, you will want to protect. So as surely as the seasons shape your adventures, let them too spark action for the places you go. A short video from last year skating on the lake with friends and dogs.